More spacious inside, more glass outside, with more power and, more importantly, a few more angles and curved surface details, have been added to its compact, slab-sided exterior. Quintessentially Japanese, this new Cube took Tokyo by storm. A pocket-sized fun-and-function cocktail mixing the charm of Godzilla and the wit of Mothra, buyers were smitten. The Nissan Cube soon found an audience outside of Japan – not in person, but through its exposure in fashion and automotive magazines, videos and on the Web. Back to today, more than 10 years since its original appearance and the Nissan Cube is ready to go global next year in an all-new, dramatically rethought third generation design that is clever, quirky, witty, fun and uniquely functional. And still totally square. 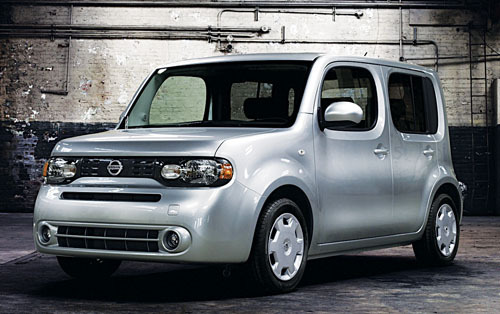 More than just unique geometry, however, the new 2009 Nissan Cube is also conceived as a totally different take on an automobile – a car that doesn’t want to be defined as car. The third generation Cube with its square, quirky, stand-out design will soon be in Europe.